As far as Food Trends go, Pork is an odd duck. After many years (even decades) of virtual banishment from many restaurant menus, this “other white meat” has surged with a vengeance. Pork Belly Anything, Pulled Pork on Anything, and Bacon Anything is all the rage in restaurants from casual breakfast joints, all the way to fine dining establishments. It is getting quite tiresome to be honest. The Chinese diner, insulated and bemused by these strange Western trends, have never shied away from this beautiful meat. Kalvin’s – a relatively unsung Chinese restaurant on the East Side of Vancouver serves two of the finest examples of Pork dishes in town. 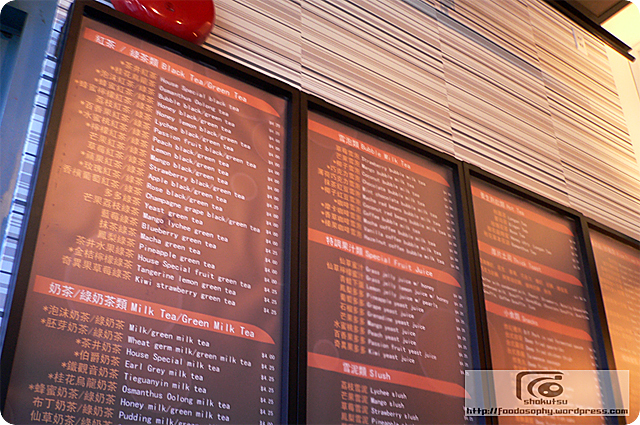 Kalvin’s Szechuan, is a Taiwanese-run restaurant that specializes in Sichuan cuisine by way of Taiwan. 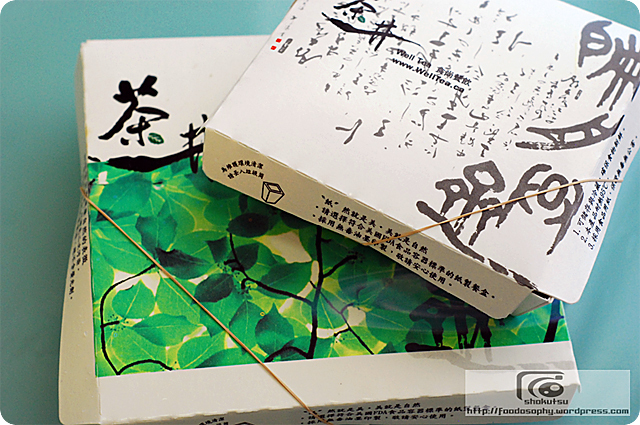 Taiwan became an incubator for Sichuan-Taiwanese cuisine when the civil war forced the defeated Chinese nationalists to retreat to the island of Taiwan and declare the Republic of China (Taiwan) as a sole governing authority over all of China. The connection to Sichuan (and thus its cuisine) is a primarily symbolic and spiritual one as Sichuan province was the last stronghold of the Republican forces and the last to fall to the Communist troops. Chongqing (in Sichuan province) was also the home base of Chiang Kai-Shek’s Republic for many years. The two dishes examined here, however, are not Sichuan in nature – they both probably originate from other parts of China. We will have a look at the Sichuan inspired dishes here in a later post. I think there is a strong love of beef noodles in this city judging by how fast and furious the reviews of Beefy Beef Noodle came about not long after it opened its doors. The poor availability of parking in this area really turned me off from going, although I’d driven by several times over the past year thinking that I might drop by if an empty spot was seen. Lucky for me on this day, there was one. Inside, the place was quite busy at it was approaching the end of a weekday lunch hour. Strangely though, the crowd was very young. I felt like there should have been a high school or two right next door. I supposed you could call this a Taiwanese cafe, if there even is such a term. While I was not really interested in wolfing down a big hot bowl of noodles, I decided instead to try out another stereotypical dish in this genre, the crispy salty peppery chicken with rice. Served with some light pickled cucumber and nut sides, as well as some steamed white rice, it was a good deal at under eight dollars (if memory serves right). My really casual server was mingling around with her co-workers and appeared distracted for some reason, so getting this out to my table seemed like a chore. I don’t really expect much from the wait staff in HK cafes either, so I should not have been too disappointed, but for some reason I was by the lack of attention. Its hard to believe but it was a year ago this week that I was chilling out and relaxing on the beaches of the Hawaiian islands. Good memories and fun times eating my way around Oahu are still fresh in my mind. I can remember upon my return to the west coast that I had it in my mind to try and find anything in the GVRD that resembled the offerings or stylings of my trip. I reckoned my best bet would be something like this, as it had some familiar North American fast food/diner items. After some very preliminary searching, I discovered an establishment on Kingsway with Honolulu in the name, but alas, disappointingly I learned that it was more of a Hong Kong-style cafe. So it was with a tingle of excitement that caused me to stop when I randomly drove past the Hawaii Cafe. Built into the same building as a convenience store and near a gasoline stand at an awkward three-way stop intersection, parking is sparse and difficult to acquire. You could park down the road at the larger pub with well-sized car lot and walk down, which would be my suggestion. As I got closer however, my hopes of a Hawaii-themed meal were struck down, as I noted it was billing itself as a “Chinese food and Taiwanese beef noodle” place. Recently opened judging by the signage, I figured since I had come this far, I would venture inside. Taiwan, one of the few countries that I have not visited in Asia. As such, my exposure to the island nation’s cuisine is still a bit hazy in my mind and my only experiences have been here in North America. Through the years and particularly in the Vancouver area, I’ve been taken to a few places that feature Taiwanese beef noodles. Lao Shan Dong is one of them, and I can count at least five trips to eat their variation of this dish. Nestled in a commercial building facing the busy Kingsway road right across from Metropolis at Metrotown, there seemingly is always a decent crowd inside. Perhaps the constant opening and closing of the door results in the constant chilly temperature inside the glass window enclosed eatery – I never feel quite comfortable in there. Alas, a steaming bowl of noodles in hot soup can remedy that, but the initial waiting time is always killer. With the beef noodles taking longer than other dishes, such as the various mini appetizers that are marinated, pickled, etc. (pig’s ear, anyone?) that are displayed on one of the counters, I’ve on some occasions ordered these dumplings that seemed more boiled than steamed judging by all the water on the bottom of the plate. With a thicker skin, and a not so flavourful interior, I get these more for filler than anything else. Its a well documented fact that finding good eats in certain places is always a challenge. Airports. Train stations. University campuses. Perhaps its the transient nature of these places, full of people on the move and just wanting a quick bite as they come and go. The enclave that is the University Village is an interesting microcosm of the perceived general populace of students who attend this institution. Set in this two block area, the overwhelming majority of retail space is taken up by places to eat… with many of them are ethnic. There’s been a lot of turnover in recent years as well, be it swaps in ownership/management (e.g. Suga Sushi), or just rapid closures (e.g. some taco shop lasted mere months before shutting down). Coincidentally, this a fore mentioned collapsed fast food joint is now the site of the subject of this post, Well Tea & Asian Cuisine. 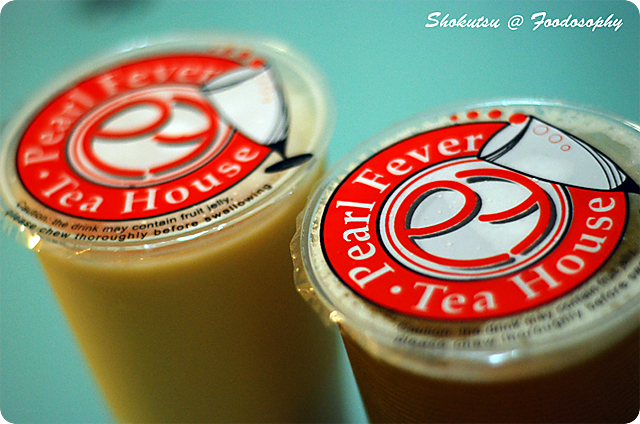 Located not too far away is the Pearl Fever Tea House. So it was a little bit surprising to find yet another bubble tea serving place pop up. But given the large Asian student body at UBC, I suppose they have the right demographic in dense concentration to survive the dangers of potential “bubble tea cannibalization”. This outlet of Well Tea also has a place to eat in, its in an area accessible by a steep climb up some stairs to the second floor. I had no idea there was space up there, as I don’t think the previous tenant had seating up there. Regardless, with my intention to only get something to go, I only glanced up at the alleyway leading to the seating area, and can only guess at how many people can actually fit up there. I’m not sure if you are like me, but do you ever find some menu’s really daunting? And I’m not talking in terms of not knowing the cuisine. Its the sheer size and volume of choices, especially in places like run-of-the-mill Chinese restaurants, or in this case, bubble tea shops. I often wonder how one can come up with twenty-odd dishes that are listed under generic headings such as beef, chicken, pork, rice and noodles. The same goes for tea. Its almost like looking at the departures screen at YVR. After going through my fair share of bubble teas this past year, which was preceded by very little exposure or interest to this drink, I’ve come to the conclusion that a lot of them taste the same to me. Perhaps this is because I often sample the same base tea, and don’t get creative with the extras beyond the pearls. In fact, the pearls are likely the only true distinguishable thing (too soft, too hard, too chalky, etc.) between one place and another for me. It doesn’t mean I don’t like bubble tea. But perhaps I should stop drinking it for a while. 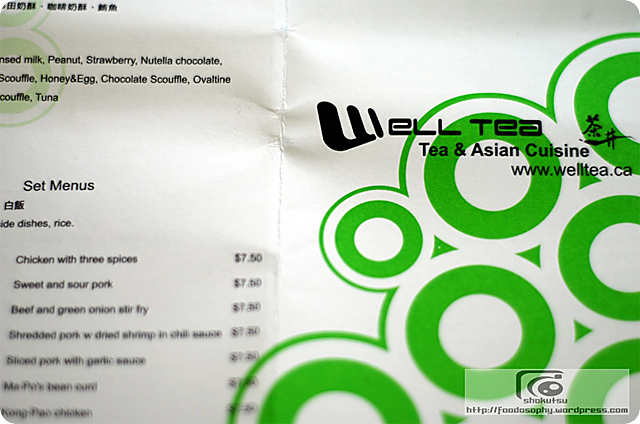 The offering at Well Tea is nothing extraordinary, and if I had to choose, I’d go with Pearl Fever. Take-away orders are available, and upon opening the bag once I was back home, I smiled when I saw these distinctive looking packages containing my meal. Not the usual Styrofoam containers you get at other fast food places, or as boxes to take home any left overs at restaurants, these had a clear Asian motif. Not knowing what they say, I can only guess they are a generic brand of packaging, but well suited to the food that can be had here. To further explain my earlier sentence, it seemed that a lot of the quick snack food items come with a trio of vegetable-based sides. These would be slotted neatly into the separated compartments built into the container. On this day, it was a very bitter tasting, gai-lan (Chinese broccoli), a spicy miso-flavored eggplant mixture, and lastly a strange cabbage kimchi and bean sprout pairing. Suffice it to say, none of these were any good in my humble opinion. As you can see, my main target for my lunch was the fried chicken “nuggets”. Flavored Taiwanese-style, they had that fragrant scent that I enjoy with this kind of deep fried chicken. The chunks of meat were crispy on the exterior but still very juicy inside. 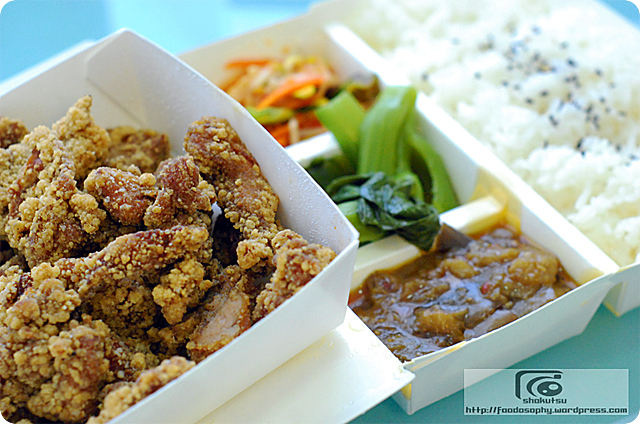 I won’t go as far to say I like them over the chicken karaage at Suga located upstairs, but not bad for the low price. Its noted that the owners of Pearl Fever took their inspiration from the valuable gemstone that most people associate with their namesake. But it would also seem worthwhile to mention that their feverish desire to promote the world of Asian drinks has spread to their business goals as well, with the opening of their latest bubble tea shop on the campus of UBC three years ago (following their flagship store in Coquitlam and their second in Surrey). 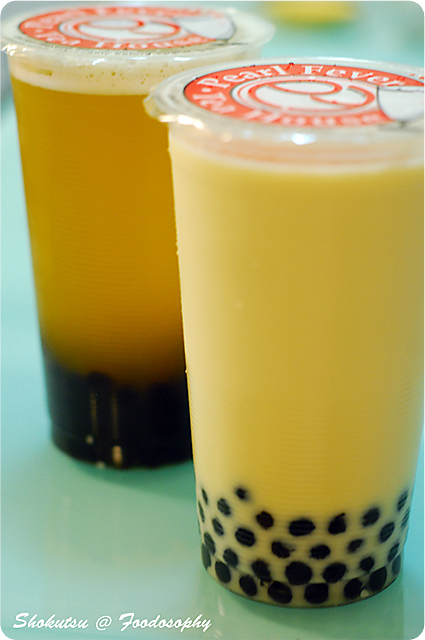 As most people know, the origin of bubble tea is generally accepted to be the island of Taiwan in East Asia, and drinks are based on a chilled or hot blend of tea, juice, milk, and other liquids with various flavorings. With the most popular of these add-ons being the round droplets of gummy tapioca balls, hence the association of pearls. With a chewy bite, that when bad can be disgustingly chalky, I find that they have a strong polarizing effect, people either hate them or love them. I’m one of the latter. 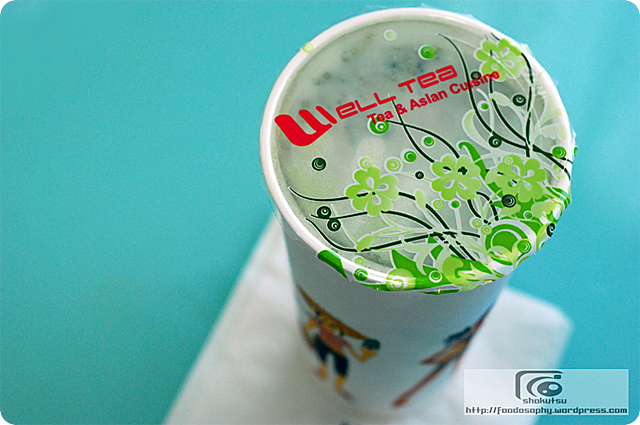 The pair of cups you see above are a Green Milk Tea with pearls, and a Lychee Green Tea with pearls. The creamier milk variety does make for a thicker consistency obviously, whereas the straight tea goes down a lot quicker through the wide straw and I find I drink that much faster as a result. The tapioca balls here are of a good consistency, not too tough and not overly cooked so they fall apart like powder upon biting into them. The liquids themselves were smooth, uncomplicated and without surprises, pleasant in flavor and satisfying overall. 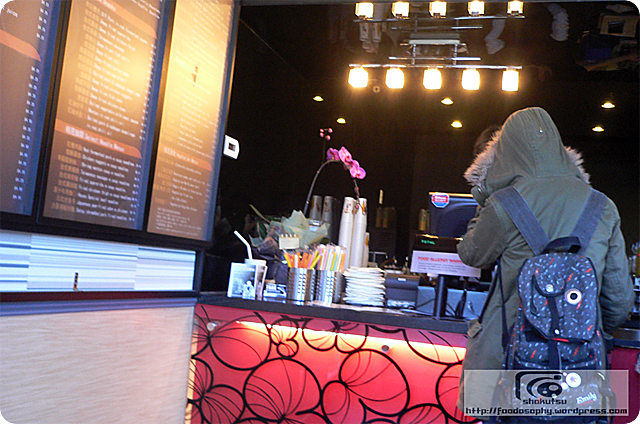 Some of our readers may recall a discussion that arose for a previous post on bubble tea in Vancouver, and the general “technology” that you find in these shops. I found it interesting that Pearl Fever had their very own, store branded seals that were affixed to each cup. I kind of like this subtle touch to mark their territory amid all the usual generic cups of bubble tea you see in the marketplace.